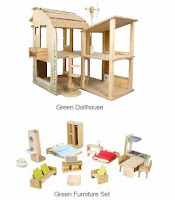 The new 2009 Green Dollhouse by Plan Toys is a cutie. 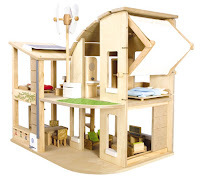 It has a lovely design--and much more interesting than the Eco Dollhouse on the market. I'll definitely be adding this one to my collection. I am particularly fond of the biofacade, the adjustable shade canopy and the recycling bins. Note that the house comes with furniture (kitchen set looks kind of cool. 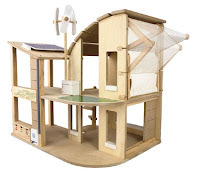 Also, I hope that is a composite wood pattern and not floral on the furniture...hmm) and also features a wind turbine, solar cell panel and rain barrel. Man oh man, do I want to get my hands on this house and decorate! The house should be available in April. Expect to pay about $240 for the furnished house and $190 for the unfurnished house. The furniture will also be sold separately for about $65. That really is one good looking house. My mouse finger (i.e., purchasing finger) is already twitchy just looking at it. Yeah, it is cool. It looks kind of like a renovated barn. Got to have it! It's only about $200. Now "Laurasweet" is gonna steal your info...and images. Even so---I don't mind people sharing the info! I want his so bad! This is so cool. I adore Plan Toys!